"I do" – when you speak these golden words, it’s only fair you do it in a setting that’s just as beautiful. 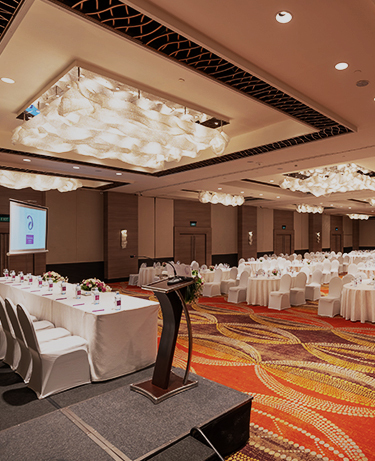 Our indoor and outdoor venues make for a plush ambience, be it during the day or at night. Add to it the finest meals and décor - and you’ll have the best day of your life! Our majestic ballrooms, elegant courtyard, open garden spaces and a charming little village make sure your vows feel as heavenly as they really are. Thoughtfully designed, they ensure an experience as smooth as your marriage ought to be. We lay out a sumptuous spread of the most delightful local and international cuisines, so that you and your guests can truly relish the wonderful occasion. From delish appetisers to a rich main course to divine desserts, all of it ensure your wedding leaves an aftertaste that is fondly remembered for years to come. Mark your special day at our magnificent ballroom with a separate dance floor and a host of other unique facilities. Savour a ceremony or a party dipped in plushness at the Atrium. Expect delicious international cuisines in a buffet or a formal sit-down style to please your guests.